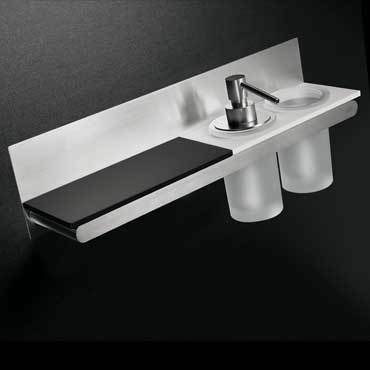 Given the modular logic in their design, the AccessoriesSteel bathroom accessories, made of AISI 316L stainless steel, with DuPont™ Corian® shelves can be composed at will. 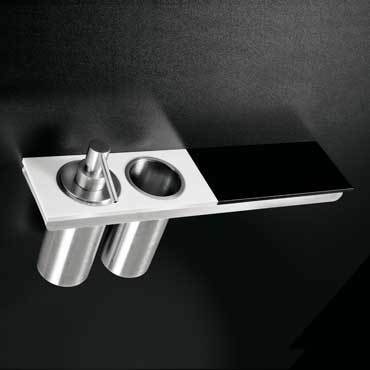 All the elements are fully interchangeable, giving total freedom of customization. 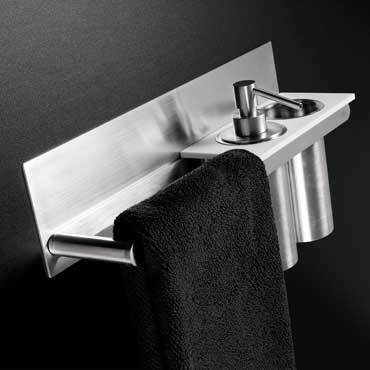 The structure can be left free so that it can have a towel holder function , or it can hold a shelf unit, or even a two-hole shelf for dispenser and glass. Here are some examples of 400 mm configurations with plate. 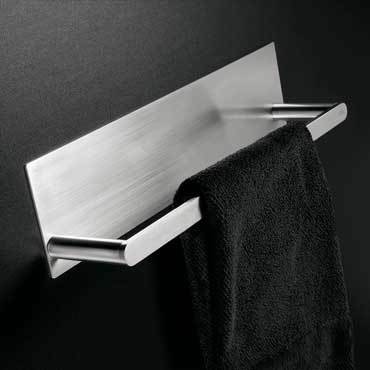 AB.PS06.B.50.00 - Wall-mounted towel holder, 400 mm long, with plate. 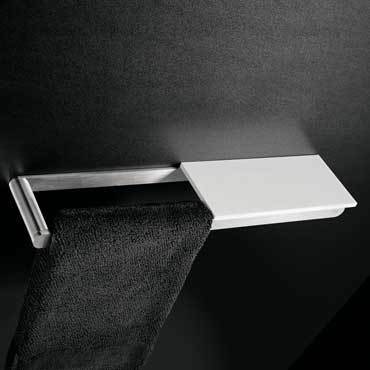 AB.PS00.B.50.00 + AB.IN03.B.00.28 - Wall structure for shelf, 400 mm long, with plate and shelf in DuPont™ Corian® in Deep Nocturne colour. 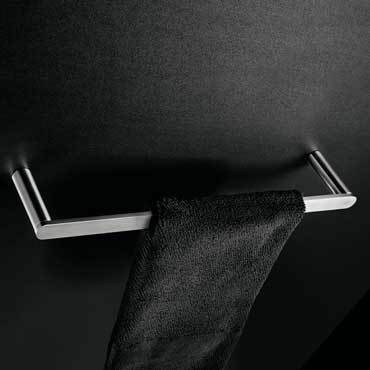 AB.PS00.B.50.00 + AB.IN03.D.00.28 - Wall structure for shelf, 400 mm long, with plate, shelf in DuPont™ Corian® in Deep Nocturne colour and towel holder function. AB.PS00.B.50.00 + AB.IN03.D.00.28 + AB.IN03.E.00.20 + AB.IN01.C.50.00 + AB.IN02.C.00.00 - Wall structure for shelf, 400 mm long, with plate, shelf in DuPont™ Corian® in Deep Nocturne and Glacier White colour, glass dispenser and glass. AB.PS00.B.50.00 + AB.IN03.D.00.20 + AB.IN03.E.00.28 + AB.IN02.B.50.00 + AB.IN01.D.50.00 - Wall structure for shelf, 400 mm long, with plate, shelf in DuPont™ Corian® in Glacier White and Deep Nocturne colour, dispenser and glass. 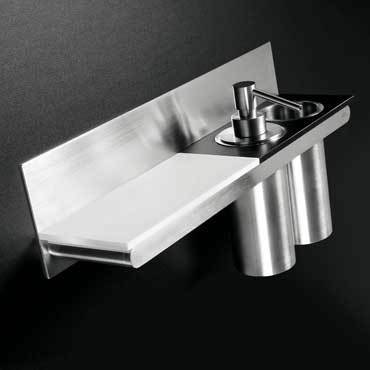 AB.PS00.B.50.00 + AB.IN03.E.00.20 + AB.IN02.B.50.00 + AB.IN01.D.50.00 - Wall structure for shelf, 400 mm long, with plate, shelf in DuPont™ Corian® in Glacier White colour, glass, dispenser and towel holder function. Here are some examples of 400 mm configurations without plate. 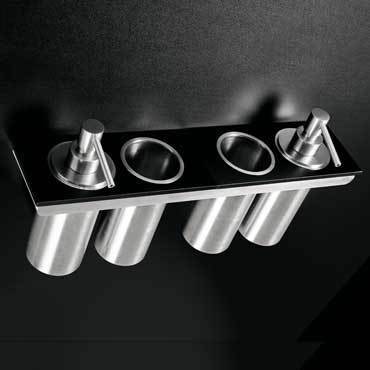 AB.CS00.B.50.00 + (2x) AB.IN03.A.00.28 + (2x) AB.IN02.B.50.00 + (2x) AB.IN01.D.50.00 - Wall structure for shelf, 400 mm long, with shelf in DuPont™ Corian® in Deep Nocturne colour, double dispenser and double glass. 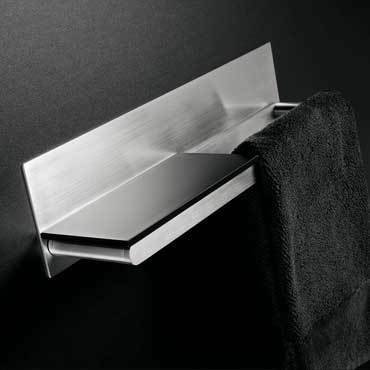 AB.CS06.B.50.00 - Wall-mounted towel holder, 400 mm long. 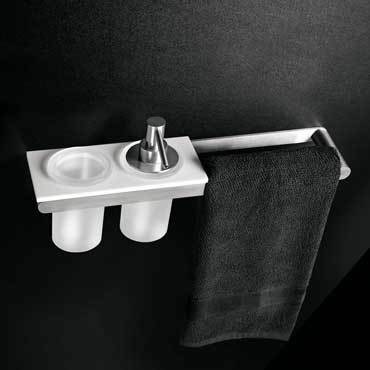 AB.CS00.B.50.00 + AB.IN03.D.00.20 - Wall structure for shelf, 400 mm long, with shelf in DuPont™ Corian® in Glacier White colour and towel holder function. 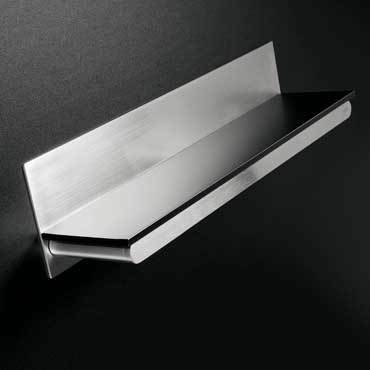 AB.CS00.B.50.00 + AB.IN03.E.00.20 + AB.IN02.C.00.00 + AB.IN01.C.50.00 - Wall structure for shelf, 400 mm long, with shelf in DuPont™ Corian® in Glacier White colour, glass, glass dispenser and towel holder function. 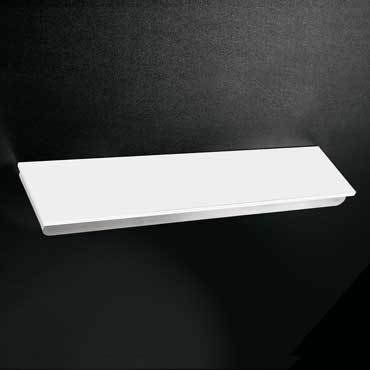 AB.CS00.B.50.00 + AB.IN03.B.00.20 - Wall structure for shelf, 400 mm long, with shelf in DuPont™ Corian® in Glacier White colour. AB.CS00.B.50.00 + AB.IN03.D.00.28 + AB.IN03.E.00.20 + AB.IN02.B.50.00 +AB.IN01.D.50.00 - Wall structure for shelf, 400 mm long, with shelf in DuPont™ Corian® in Glacier White and Deep Nocturne colour, dispenser and glass.